Protection/ preservation and Development of Ancient Monuments/ sites. Preparation of Plaster Casts Ancient sculptures/ antiquities. Setting up of Zonal Museum. Setting up of State Archaeological Museum. Swami Omanand Sarswati Puratatva Sangrahalya at Gurukul Jhajjar will also be constructed by Govt. on the land donated by Gurukul, Jhajjar in which rare antiquities and the priceless artifacts of the collection of Gurukul Jhajjar will be displayed. Haryana is the region where, along the banks of the River Saraswati, the Vedic Civilization began and matured. It was here that the Vedas were written, as the Aryans chanted their sacred Mantras. Replete with myths and legends, Haryana's 5000-year-old history is steeped in glory. Mahabharat knows Haryana as Bahudhhanyaka, land of plentiful grains and Bahudhana, the land of immense riches. The word Haryana, occurs in a 1328 AD Sanskrit inscription kept in the Delhi Museum, which refers to the Haryana region as The heaven on earth. 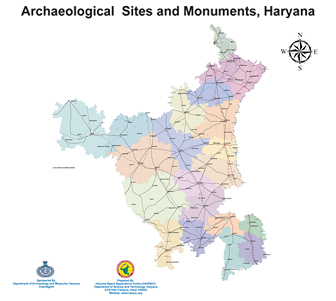 Excavations and Explorations of various archeological sites in Haryana, like Naurangabad and Mittathal in Bhiwani, Kunal in Fatehabad, Agroha near Hissar, Rakhi Garhi (Rakhigarhi) in Jind, Sites in Rukhi (Rohtak) and Banawali in Sirsa have evidence of pre-Harappan and Harappan culture. Findings of ceramics, terracotta objects, sculptures and ornaments from different sites at Pehowa, Kurukshetra, Yamunanagar, Panchkula, Satkumbha and Panipat have proved its historicity. Haryana has been the scene of many wars because of it being "The Gateway of North India". As years rolled by, successive streams of Huns, Turks and the Afghans invaded India and decisive battles were fought on this land. After the downfall of the Gupta empire in the middle of 6th century AD north India was again split into several kingdoms. The Huns established their supremacy over the Punjab. It was after this period that one of the greatest King of ancient India, Harshvardhan began his rule. He became the King of Thanesar (Kurukshetra) in 606 AD, and later went on to rule the most of north India. In the 14th century, the Tomar kings led an army through this region to Delhi. Later the Mughal, Babur, defeated the Lodhis in the first battle of Panipat in the year 1526. Another decisive battle was fought in Panipat in 1556, establishing the reign of the Mughals for centuries to come. Taking advantage of Humayun's death, Hemu had marched to Agra and Delhi and occupied it without difficulty. In response, Bairam Khan (Akbar's guardian) marched towards Delhi. Both the armies clashed in the second battle of Panipat. Hemu was in a winning position when a stray arrow struck him in the eye. He fell unconscious causing panic among his troops. The tide of the battle turned and the Mughals won the battle. Towards the middle of the 18th century, the Marathas had control over Haryana. The intrusion of Ahmed Shah Durrani in India, culminated in the third battle of Panipat in 1761. Marathas' defeat in this battle marked the end of their ascendancy and the decline of the Mughal Empire, leading to the advent of the British rule.